This is a client library used to interact with the Newgrounds.io server. 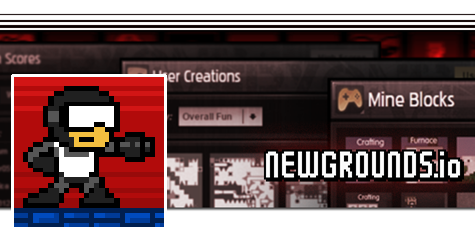 Newgrounds.io is a server API packed full of features for indie game developers. Track distribution of web-based games. Control what sites can host web-based games. Log statistics for custom events. Track referrals from in-game links. Before you can use this library, you will need to create a project on http://www.newgrounds.com/projects/games and obtain an app id from your new project's "API Tools" page. Be sure you have switched to the v3 beta! Using the Newgrounds.io.core class to make calls to the server is extremely easy! The context is an optional parameter through which you can specify the context under which the callback function will be executed. Practically all methods which support callbacks can also take a context parameter. * we will also have a user object we can access. * We can go ahead and run our onLoggedIn handler here. * we should have been given a new one at this point. * have it execute the following requestLogin function. * a mouse-click event or pop-up blockers will prevent the Newgrounds Passport page from loading. * Call this when the user clicks a 'cancel login' button from your game. * This cancels the login request made in the previous function. * This will also trigger your onLoginCancelled callback. * and have it call this. * the server has responded. Want to unlock one of those medals we just loaded? You should always be prepared to handle an error from the API. When contacting Newgrounds support, you will be expected to provide any error messages you are receiving from the server. // there was an error! Newgrounds.io can operate in debug mode. While in this mode, calls to any components that normally post data to a user account will not post anything, but rather, simulate a real post. Additionally, if you watch the server results via your browser's network inspector, JSON objects will contain a lot more meta information and be much more readable in debug mode. Copyright (c) 2015 Newgrounds Inc.